The Blind Spot Mirrors increase the view of surrounding area to assist the driver when checking surrounding area before changing lanes. When the mirror select switch is in the “L” or “R” position, the outside rear view mirrors will automatically angle downwards when the vehicle is reversing in order to give a better view of the ground. To disable this function, move the mirror select switch to the neutral position (between “L” and “R”). The outside rear view mirrors can be cleared using the mirror defoggers. Turn on the rear window defogger to turn on the outside rear view mirror defoggers. 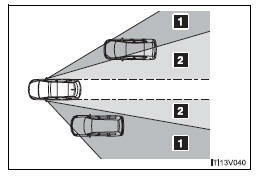 The mirror adjustment can be entered into memory and recalled automatically by the driving position memory. Failing to do so may result in losing control of the vehicle and cause an accident, resulting in death or serious injury. • Do not adjust the mirrors. • Do not drive with the mirrors folded back. • Before driving, be sure to extend mirrors and make an adjustment properly. Do not operate the control or scrape the mirror face. Use a spray de-icer to free the mirror.